There are some values that we all hold near and dear to our hearts. Those virtues instilled in us by our parents and grand parents, our neighbors and nations. These are our family values. Sculpted by generations of experience they are our inheritance and our legacy to the future. 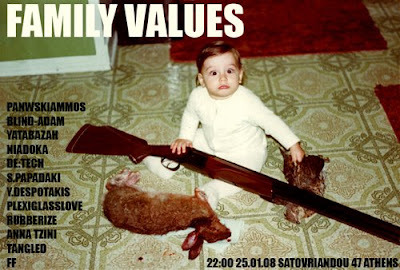 Family Values is an open invitation for examination, deconstruction and reconstruction of that which is understood as familial in contemporary Athenian Culture.